"VGC except needs some work (bellows leak, all notes are kind of wheezy and some are weak, plus needs cleanup, etc. - sold AS-IS), keys of Bb-Eb, red pearloid covering, red bellows with gold trim, 30 buttons in three rows, 8 bass buttons, "Original Hohner" imprint on back, used for Tex-Mex and other styles, with worn straps and beat semi-HSC, price reduced"
How would anyone else grade it? Me? Poor/Medium at best. Looking at one list I have, it seems (for example) the Hohner Club III BS and the Hohner Club III M might be voiced LMM. I'm thinking of buying an old three-reed LMM Hohner off ebay. How can the seller of a Hohner Club III tell me if it's an LMM accordion? If it has a switch behind the keyboard it is likely to be LMM, if no switch it is likely to be MMM, but there may be exceptions. To be sure the seller would need to have enough knowledge to tell from the sound, or from looking at the reeds. You could try asking the seller for a sound clip? If it has a switch behind the keyboard it is likely to be LMM, if no switch it is likely to be MMM, but there may be exceptions. I think this is an MMM. I've got one that looks exactly the same which is MMM. Theo has recently overhauled it for me and it is a lovely box. 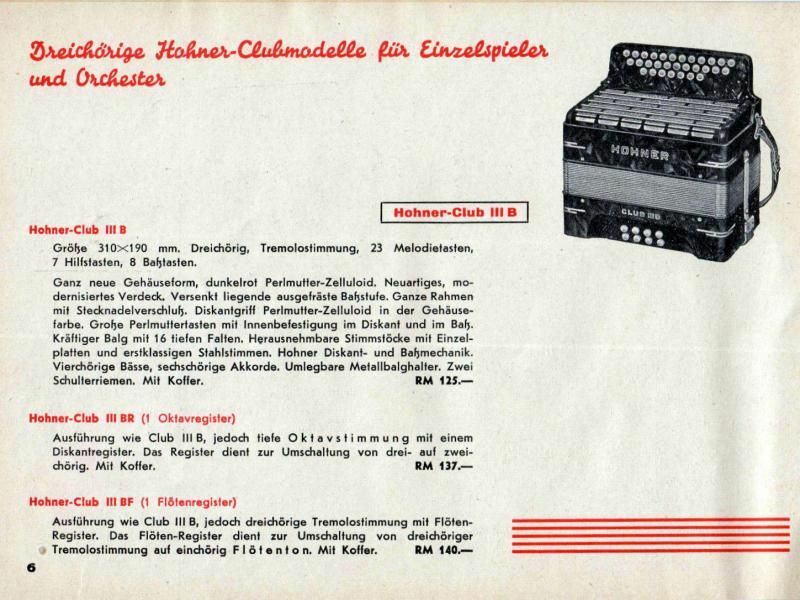 There seem to have been a lot of variants among the 3 voice Hohner Clubs, even the no-switch ones. They differ in the overall size of the casework, whether the keyboard plate is black or pearloid, the grille material (metal or celluloid) and how it is perforated, and the way the reedblocks are situated on the soundboard relative to the pallets/action. Most of the ones I have seen have 3 rows of pallets on the soundboard which can result in a noticeably different timbre from the notes on the inside row of buttons. That's one significant difference with the Modell 234(?) I mentioned and illustrated above, since it has only 2 rows of pallets and a very open metal grille. Still, the 3 voice ones sound great also. I love the ones with pearl buttons and zinc-plate reeds. As an afterthought to my previous post..apparently Weltmeister makes a Club Accordion in G/C. Has anyone tried these out? Also, are any of the "high end" [with a 3rd.row of 2, 4 or 6 buttons] 2 row French accordions in a Club tuning? That one is very similar cosmetically to the one I am calling a "possible 234." Unlike most of the Hohners I have seen identified as 235 (or possibly 255) both have a plated stamped-metal grille. The current ebay accordion also looks in very good condition, although unlike mine its original straps show some wear. 1) The bass side coupler switch is in a different position, more similar to the bass coupler on the earlier ebay accordion I cited above (a so-called 235 or possible 255). 2) There is a backplate that would hold the keyboard (and melody-side switches) away from the player's body. This looks original in this case. I can't see whether there are 2 or 3 melody-side switches and I'm not sure I understand the seller's description of these. 4) I think the seller's description implies 3 voices on the melody side, but I think 4 or 5 is more likely. Pete Grassby had one on his stall at Witney this year. That I would have liked to hear. I actually meant to write that I would have liked to hear Mr. Kirkpatrick playing it, but I don't know Mr. Grassby so it is great to hear a musician who is new to me. It was Mr. Kirkpatrick who was lugging that huge road case when I gave him a lift to the airport nearly 20 years ago. Where 'F'='flute' perhaps, though modern accordion terminology usually uses 'clarinet' for a single M reed. Hoping that my new acquisition will sound the same ! "Hoping that my new acquisition will sound the same"
Apologies to the tele programme Father Ted. Are there happy owners of model 255? My 255 is Bb/Eb with "Hohner Germany" reeds that are considered the best reeds of Hohner. Strange but this box seems to be much worse than Club III BS when testing my favorites L, M and LM registers. Is it because construction of the box or something wrong with my accordion? Box is after tuning and some maintenance. My friend has 255 C/F - it is about the same, but bass side not so nice like in my box - almost no difference between registers. Now I am thinking about to use this reeds in another accordion. Is it worth a try, or may be these reeds are not so good? Any ideas? For another example of a 4 voice pre-WW2 Hohner club, see the photo below - a grey, no-switch Hohner club voiced in MMMM, BbEb. Great box with the "HOHNER GERMANY" reeds. Shown here on left along with the "234-like" Hohner in LMMM discussed at the beginning of this thread. Here is a pair of very similar boxes but these are both 3 voice LMM with three switches. This gives any combination of reeds including none. Build quality is excellent. These are available for sale if anyone is interested. They are currently unrestored.